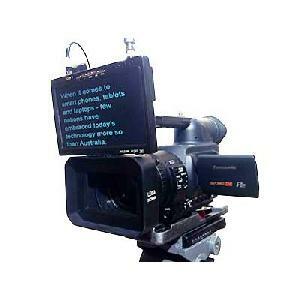 Autocue and Teleprompter Hire Service in Sydney NSW Australia. 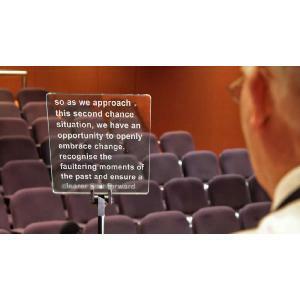 On camera or on stage with over 30 years’ experience Speak Easy provides an Australia-wide teleprompter hire service that is second to none. We understand there are no repeat performances when conducting your events...that is why the professionals at SpeakEasy Teleprompt will be there for you from beginning to end with all the support and assistance you need, when and where you need it. No matter what size your event - whether you've managed many events or this is your very first - SpeakEasy Teleprompt's autocue expertise will soothe any pre-performance jitters and support the best presentation(s) possible. With our professional staff and assistance, your event will go smoothly and achieve great results. • adapt for one or two lecterns, or for presenters who roam the stage utilising a plasma screen. For conferences, presentations, AGMs etc. our podium or "Presidential" style Teleprompters are popular, while we can also integrate with plasma screen displays. We also believe the Cueword software we use is the best available anywhere in the world due to its flexibility and ability to make script changes quickly and easily.